I've heard of the debt snowball method for paying off debts quickly however I wasn't sure how to implement it for family. It seemed easy just order your debts from lowest balance to highest balance and once the lowest debt is paid off, apply it's payment to the next debt and continue until you can yell, "We're Debt Free!". The more and more I thought about tracking it the more and more it became complex for me. How would I track it? What if I made extra payments? How do I calculate the total payoff balance including interest from month to month? Too much to think about for someone who doesn't like numbers. So like always I turn to Google when in need of a solution and as expected Google did not disappoint me. I found a pretty nifty spreadsheet at LifeHacker that totally solves my dilemma. Not only will I be able to track my debts but the spreadsheet offers 2 ways to payoff your debts. The first is the debt snowball method where you pay off the debts with the lowest balances first. This method is most popular as it builds confidence quickly as debts are eliminated fast due to the low balances. However you may pay more money since debts with higher interest could potentially have a higher balance and be further down the line on the debt snowball. I didn't like that idea. 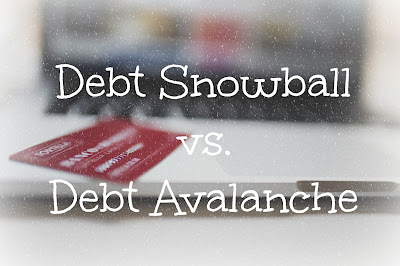 Second is the debt avalanche method where you pay off your debts with the highest interest rates first, this way you pay the least interest over time. This method makes the most sense in savings but can take longer to see progress depending on how much the first balance is of your highest interest debt. I personally thought I would pursue the debt snowball method because of the great things I've heard about it but after seeing that it doesn't save me money I would rather wait to see progress than pay more over time. I've downloaded the spreadsheet and started filling it out. Once I have it completely filled in I will let you guys know when my expected pay off date is and the balance. (Insert Climatic Music) I hope you enjoyed this post about a free resource I'm using on my debt free journey. Leave me a comment below with your preferred method for tracking your debt payments and what method you use. And as always thanks for reading.